Founded in 1920, Boynton, Waldron, Doleac, Woodman & Scott, P.A. is Portsmouth's oldest law firm. Our attorneys combine knowledge with experience to achieve positive results for our clients in family law, estate planning, business law, and personal injury matters. We provide aggressive and compassionate representation to business owners and families seeking legal help in the Seacoast area. If you need quality legal services in a transactional or litigation matter. Our Seacoast law firm maintains a strong commitment to our clients. We proudly serve many grandchildren and great grandchildren of local business owners and families who first came to us over 80 years ago. Our attorneys and staff are actively involved in the Portsmouth community. 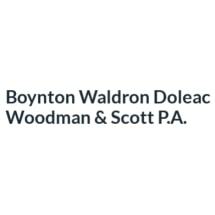 Boynton, Waldron, Doleac, Woodman & Scott provides leadership and legal services to a variety of local charitable, cultural, and political organizations.